If the heyday of British air-racing can be evoked by a single aeroplane, it is surely the Percival Mew Gull. It has a look that is quintessentially ‘of its time’ – with an economy of line that simultaneously suggests competitive zeal and genteel elegance. It is, to put it plainly, a combination of rakishness and charm no modern design could ever match. 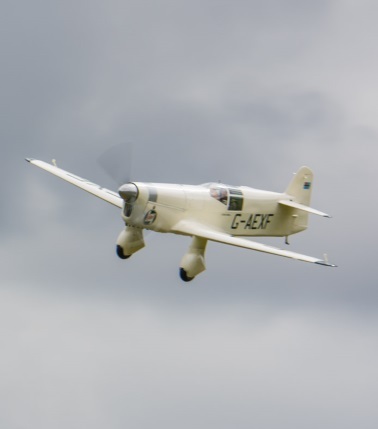 Predominantly of wooden construction and designed and built by Captain Edgar Percival, the type first flew in March 1934 and was produced specifically for racing and long-distance, high-speed touring. Slender, a single-seater, it offered no luxuries – only performance. A maximum speed of 265mph was claimed for a modified version. Of the six Mew Gulls built, one in particular stands out. Bearing the registration G-AEXF and splendid in white, it was flown by the legendary race-ace and test pilot Alex Henshaw in numerous contests for the King’s Cup and other prestigious trophies, and on an epic record-breaking flight from England to Cape Town in 1939. Now 80 years young, G-AEXF is the survivor of several major crashes, innumerable hair-raising ‘moments’ and a spell of wretched neglect, but is these days safely in the hands of the Shuttleworth Trust at Old Warden airfield near Biggleswade in Bedfordshire. It flies on special occasions, much to the appreciation of visitors to the vintage air-displays that take place there each year. The sight and sound sooth all but hearts of flint. From the moment the Mew Gull's wheels leave the ground, there is magic in the air.